No one will ever convince me that teaching isn't the hardest job in the world. Here's Dylan Garity's take on teaching and why it's a "rigged game." Last week my mother entered a nursing home. I've just returned to Virginia after spending several days looking through the accumulation of 84 years, trying to decide what to keep and what to let go. It's not an easy process. When my father died 4 years ago my mother significantly down-sized, leaving our family home for a much smaller space. Despite it's smaller size, there is still much to consider. While cleaning house I came across a newspaper clipping regarding a late night automobile accident my father was in. That was a story I never heard as a child! There are the pictures and letters, of course, but sometimes the stories my mother told we more precious than the objects themselves. This is all a terribly hard business. It makes me want pare down my own possessions and reminds me that the things are not as important as the people. I don't have a form in mind this week, but I think writing about cleaning house is where I'm going. Won't you join me? Please share a link to your poem or the poem itself in the comments. A bouts-rimés poem is created by one person's making up a list of rhymed words and giving it to another person, who in turn writes the lines that end with those rhymes, in the same order they were given. You can read more at Wikipedia and learn a bit about the history of this form. Here is your word list. I hope you'll write with me this week. Please share a link to your poem or the poem itself in the comments. I'm quite fond of haiku, though I find it hard to write well. (Actually, I find many forms difficult to master!) 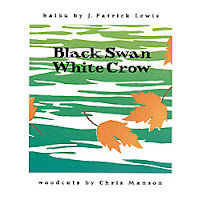 When thinking of writing haiku I often return to J. Patrick Lewis' book Black Swan/White Crow, illustrated by Christopher Manson. 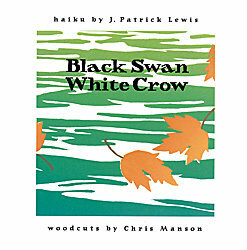 In the introduction, Lewis describes the form and encourages readers to write their own haiku. To write a haiku, you might go for a walk in a city park, a meadow, the zoo. Put all your senses on full alert. Watch. Listen. Imagine that what you are seeing or smelling or hearing has never been seen, smelled, or heard before--and may never be again. Now take a picture of it--but only with your words. The best haiku make you think and wonder for a longer than it takes to say them. I've always loved that last line. Here's one of the haiku from the book I still think about, especially when I'm at the beach. I hope you'll write some haiku with me this week. I'm thinking a lot about summer's demise and the beginning of fall, so that's where my poems seem to be going. Please share a link to your poem or the poem itself in the comments. Some folks are already back at school (myself included), but many begin in earnest tomorrow. After a bit of back-to-school shopping yesterday and some (I'm not too proud to say it) salivating over the shiny new items in the office supply aisle, I can't stop thinking about about my obsession for school supplies. One of my favorite poems about a school supply item is this one by Daniel J. Langton. I hope you'll write a little something about a school supply item this week. Please share a link to your poem or the poem itself in the comments. In the meantime, I'll be dreaming about those colored pencils.